That's why Guild Wars 2 is (/was) my choice :3 grinding is actually the worst way to level up there. Same for PSO2, even if that game does something similar. In McMMO, an IRON BLOCK is the default Repair Block. This is not the case here. What is the repair block for this server? I believe it's Gold Block now? Repair is disabled entirely. iron block was the default for the brief time it was around. The Gold block is Salvage. That one is working fine. (sorry for double posting) but wow! nice new website format! Chest Protection Sign Editing - Has also been added now. Sorry if im blind here but has the new "mcMMO" feature been added to the server or is it still being added ^_^? 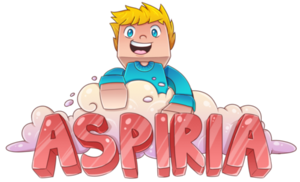 My goal is to rebrand/fix up all the messages to: "Aspiria > (message)" for majority of commands, so if you guys stop a command that is missing that please tell me and I'll have it fixed. Chest Sign Editing - Edit your chest protection signs and add info to line 3 and 4. Districts Deletion Fix - This is in the process of being worked on, we have also allowed the ability to buy more blocks in the store. Hopefully the new website will also be launching within days.